We have a strict booking policy here at Luscious Glow as we tend to book out very quickly. 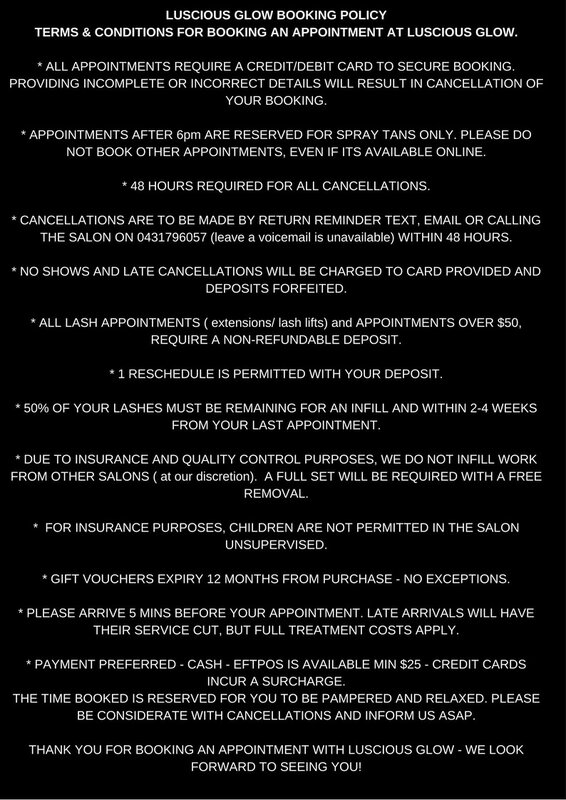 Please allow up to 6 weeks notice for all eyelash enhancement bookings with our Master technician. All bookings must be made online and deposits paid upfront. I loved the tan it was even, natural and lasted over a week thank you very much I look forward to coming back! Just got back from the UK yesterday, so am suffering a little with jet lag, but the overwhelming response was that the tan looked awesome at the family wedding! be coming back anytime i need a tan! Love, Love Love it!! Thank you so much! You are the best! Woohoo! No reaction! Love it! Thank you! I just wanted to give a little shoutout to Luscious Glow - Spray Tanning Canberra. I just had a tan done there this morning. I have never had one done before!! Being a bigger girl, I was already a little tentative but add in the fact that I had a bub 4 months ago, well lets just say I named him Mark for a reason - That's what he left all over my tummy! Arety made me feel so, so comfortable. I didn't even think twice about stripping down to my delicates! The tan itself felt so nice being put on, just a light spray and it dried pretty much instantly! I'm now getting ready to wash the bronzer off and I can already see it's going to look great! I highly, highly recommend Luscious Glow Spray Tanning and just want to point out to lager ladies - Don't miss out on such a lovely confidence building experience because you're a little self conscious - We all deserve to look amazing on our wedding day - So get in there, get your girls out and have fun with it - You'll feel great! !